Messier 83 (also known as the Southern Pinwheel Galaxy or NGC 5236) is a barred spiral galaxy in the constellation Hydra. It is one of the closest and brightest barred spiral galaxies in the sky. It was discovered by Nicolas Louis de Lacaille on February 23, 1752 at the Cape of Good Hope. Later (in March 1781) Charles Messier added it to his catalogue of nebulous objects. 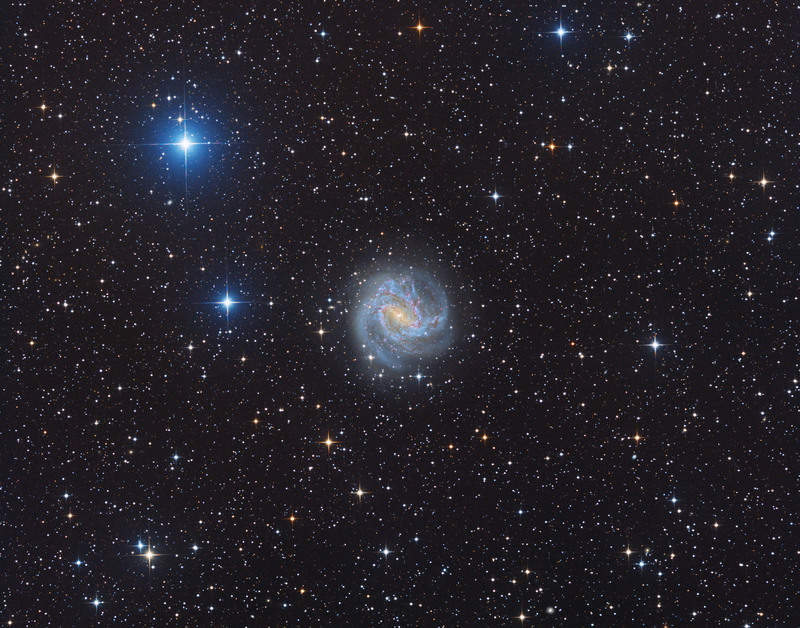 Situated at approximately 15 million light-years away, M83 is at the center of one of two subgroups within the Centaurus A/M83 Group, a nearby galaxy group. Centaurus A is at the center of the other subgroup. These two groups are sometimes identified as one group and sometimes identified as two groups. However, the galaxies around Centaurus A and the galaxies around M83 are physically close to each other, and both subgroups appear not to be moving relative to each other. Six supernovae (SN 1923A, SN 1945B, SN 1950B, SN 1957D, SN 1968L and SN 1983N) have been observed in M83. Another image of M 83, taken with 12" ASA Astrograph can be found here . L:9x10min,R:7x10min, G:7x10min, B::7x10, Bin 1 Total Exposure Time 300 min.